Name Variation Samuel Milton VanNatta was also known as Milton. Samuel Milton VanNatta was born in April 1856 at New Jersey. He was the son of Moses B. VanNatta and Samantha (?). Samuel Milton VanNatta married Julia Ann Withrow, daughter of John T. Withrow and Margaret Jane Wilson, circa 1894. Samuel Milton VanNatta died on 11 March 1950 at age 93. Samuel Milton VanNatta and Julia Ann Withrow lived in 1901 at Cornelia, Grant, Wisconsin. [S247] U.S. Federal Census 1870 U.S. Federal Census, by Ancestry.com, Pg 1. Stamp 158. Dwelling 6. 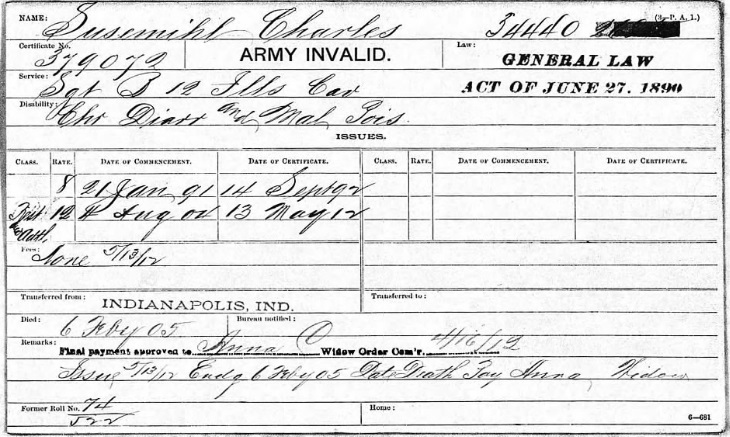 [S246] U.S. Federal Census 1880 U.S. Federal Census, by Ancestry.com, ED107. Pg 23. Dwelling 208. [S245] U.S. Federal Census 1900 U.S. Federal Census, by Ancestry.com, ED34. Sheet 10A. Dwelling 199. [S244] U.S. Federal Census 1910 U.S. Federal Census, by Ancestry.com, Dwelling 39. Stamp 230. ED42. [S243] U.S. Federal Census 1920 U.S. Federal Census, by Ancestry.com, ED120. Dwelling 164. [S250] U.S. Federal Census 1930 U.S. Federal Census, by Ancestry.com, ED45. Dwelling 66. Married Name 2 September 1868 As of 2 September 1868,her married name was VanNatta. Theresa Elizabeth Toulouse was born on 5 April 1848 at Wisconsin also reported as Apr 1849. She was the daughter of Jefferson Toulouse and Rebecca Droullard. Theresa Elizabeth Toulouse died on 18 April 1922 at Platteville, Grant, Wisconsin, at age 74. Theresa Elizabeth Toulouse had 14 with 10 living in 1910 children. [S5] Wisconsin, Wisconsin Marriages, 1835-1900, listed under Vanatta, William B. [S249] U.S. Federal Census 1850 U.S. Federal Census, by Ancestry.com, Dwelling 850. [S248] U.S. Federal Census 1860 U.S. Federal Census, by Ancestry.com, Page 90. Dwelling 684. [S247] U.S. Federal Census 1870 U.S. Federal Census, by Ancestry.com, Pg 2. Dwelling 14. [S246] U.S. Federal Census 1880 U.S. Federal Census, by Ancestry.com, ED107. Dwelling 197. [S245] U.S. Federal Census 1900 U.S. Federal Census, by Ancestry.com, ED48. Dwelling 158. [S244] U.S. Federal Census 1910 U.S. Federal Census, by Ancestry.com, ED42. Dwelling 107. [S243] U.S. Federal Census 1920 U.S. Federal Census, by Ancestry.com, ED121. Stamp 200. Dwelling 121. George Roscoe VanNatta was born on 16 November 1869 at Harrison, Grant, Wisconsin, also reported as Dec 1869. He was the son of William Barnette VanNatta and Theresa Elizabeth Toulouse. George Roscoe VanNatta died on 18 September 1941 at Parkston, Hutchinson, South Dakota, at age 71 George VanNatta Died Last Thursday; Funeral Saturday. Funeral services were conducted last Saturday morning for George Roscoe VanNatta from the Sacred Heart church and burial was made in the Catholic cemetery. He died last Thursday. George Roscoe VanNatta was born November 16, 1869, in Harrison township, Grant county, Wisconsin, and passed away September 18, at the age of 71 years. He was the eldest son of 14 children born to Mr. and Mrs. William B. and Theresa VanNatta, of whom three brothers and four sisters have preceded him in death. 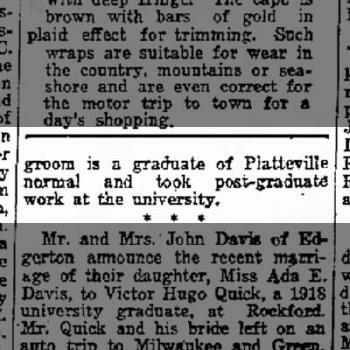 On January 10, 1893, he was married to Mary Weidman of Potosi, Wisconsin. To this union were born eleven children, ten of whom, with their mother, are left to mourn their loss. He leaves his widow, his children, mary, victor, George and Laurence of Parkston; Esther of Mt. Vernon; John of National City, California; Violet of Salinas, California; Hazel and Florence of Platteville, Wisconsin, and Laura of Richland, Missouri; with 30 grandchildren, one brother, five sisters and a host of relatives and friends. Out of town relatives attending the funeral were Mr. and Mrs. Roy Wuertzer, Miss Florence VanNatta, Will VanNatta, Mrs. George Carl, Harry Carl, Mrs. Paul Knebel, Mrs. Bert Reiter, Harry Udelhofen of Platteville, Wisconsin; Dwight VanNatta of Scotland and Clifford Adkins of LeMars, Iowa. 1895 Fifth Ward Dubuque, Dubuque, Iowa George Roscoe VanNatta appeared on the census of 1895 at Fifth Ward Dubuque, Dubuque, Iowa. [S245] U.S. Federal Census 1900 U.S. Federal Census, by Ancestry.com, Year: 1900; Census Place: Julien, Dubuque, Iowa; Roll: T623_430; Page: 10B; Enumeration District: 107. Name Variation Alma Ellen VanNatta was also known as Ellen Alma. Alma Ellen VanNatta was born in October 1872 at Grant, Wisconsin. She was the daughter of Samuel B. VanNatta and Cynthia D. Kies. [S246] U.S. Federal Census 1880 U.S. Federal Census, by Ancestry.com, ED107. Dwelling 157. [S244] U.S. Federal Census 1910 U.S. Federal Census, by Ancestry.com, ED36. Dwelling 139. Name Variation Daniel K. VanNatta was also known as Dan. 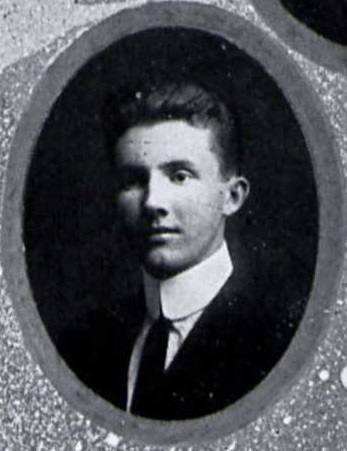 Daniel K. VanNatta was born in 1876 at Grant, Wisconsin. He was the son of Samuel B. VanNatta and Cynthia D. Kies. Married Name 25 December 1872 As of 25 December 1872,her married name was VanNatta. Ella Himan was born circa 1852 at Wisconsin. [S246] U.S. Federal Census 1880 U.S. Federal Census, by Ancestry.com, Pg 23. ED107. Dwelling 206. Ada VanNatta was born circa 1874 at Wisconsin. She was the daughter of Alonzo VanNatta and Ella Himan. Warren VanNatta was born in November 1876 at Wisconsin. He was the son of Alonzo VanNatta and Ella Himan. [S245] U.S. Federal Census 1900 U.S. Federal Census, by Ancestry.com, Dwelling 158. Name Variation Myrtle VanNatta was also known as Mirta. Married Name 14 July 1904 As of 14 July 1904,her married name was Withrow. Myrtle VanNatta was born on 20 December 1879 at Harrison, Grant, Wisconsin. Myrtle VanNatta married John Alfred Withrow, son of John T. Withrow and Margaret Jane Wilson, on 14 July 1904. 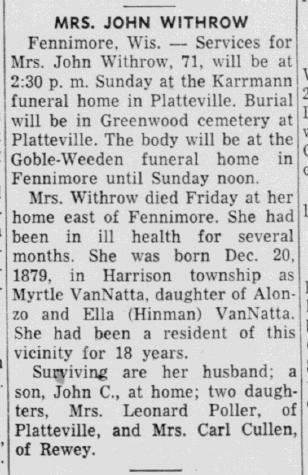 Myrtle VanNatta died in December 1950 at at home, Fennimore, Grant, Wisconsin, Mrs John Withrow (Myrtle Vannatta) obituary. Myrtle VanNatta had 3 with 1 living in 1910 children. Name Variation Margaret Jane VanNatta was also known as Maggie. Married Name 14 June 1891 As of 14 June 1891,her married name was Reiter. Margaret Jane VanNatta was born on 25 March 1871 at Harrison, Grant, Wisconsin. She was the daughter of William Barnette VanNatta and Theresa Elizabeth Toulouse. 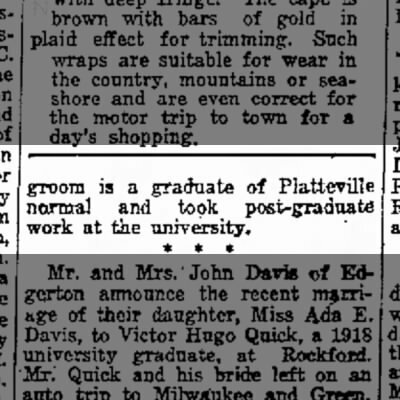 Margaret Jane VanNatta died on 10 November 1938 at Platteville, Grant, Wisconsin, at age 67. Name Variation Mabel Rebecca VanNatta was also known as Mable. Name Variation Mabel Rebecca VanNatta was also known as May Belle. Name Variation Mabel Rebecca VanNatta was also known as Maybelle Rebecca. Nickname Mabel Rebecca VanNatta also went by the name of Bell. Married Name 3 January 1893 As of 3 January 1893,her married name was Carl. Mabel Rebecca VanNatta was born on 1 May 1873 at Harrison, Grant, Wisconsin. Mabel Rebecca VanNatta died on 7 July 1942 at Platteville, Grant, Wisconsin, at age 69. She was buried after 7 July 1942 at Greenwood Cemetery, Platteville, Grant, Wisconsin. [S250] U.S. Federal Census 1930 U.S. Federal Census, by Ancestry.com, ED22-48. Dwelling 1. Name Variation Mary Emma VanNatta was also known as Emma. Married Name 25 April 1894 As of 25 April 1894,her married name was Udelhofen. Mary Emma VanNatta was born on 15 December 1874 at Harrison, Grant, Wisconsin. Mary Emma VanNatta died on 4 April 1958 at Harrison, Grant, Wisconsin, at age 83. [S250] U.S. Federal Census 1930 U.S. Federal Census, by Ancestry.com, ED22-17. Dwelling 103. Name Variation Bertha Elizabeth VanNatta was also known as Bessie. Married Name 9 June 1898 As of 9 June 1898,her married name was Duve. Bertha Elizabeth VanNatta was born on 2 October 1876 at Harrison, Grant, Wisconsin. Bertha Elizabeth VanNatta died on 8 May 1905 at Harrison, Grant, Wisconsin, at age 28. Bertha Elizabeth VanNatta had 1 with 1 living in 1900 children. [S5] Wisconsin, Wisconsin Marriages, 1835-1900, listed as Joseph Duve and Bertha E. Vanetta. [S245] U.S. Federal Census 1900 U.S. Federal Census, by Ancestry.com, Year: 1900; Census Place: Platteville, Grant, Wisconsin; Roll: T623_1790; Page: 5A; Enumeration District: 48. Married Name 5 July 1900 As of 5 July 1900,her married name was Meyer. Jessie Ursula VanNatta was born on 12 March 1879 at Harrison, Grant, Wisconsin. Jessie Ursula VanNatta died on 4 June 1901 at Harrison, Grant, Wisconsin, at age 22. Name Variation Sarah Elizabeth VanNatta was also known as Essie. Sarah Elizabeth VanNatta was born on 15 December 1881 at Harrison, Grant, Wisconsin, also reported as Dec 1880. Sarah Elizabeth VanNatta died on 23 November 1951 at age 69. Married Name 3 October 1902 As of 3 October 1902,her married name was McLinn. Alice Agnes VanNatta was born on 20 November 1886 at Harrison, Grant, Wisconsin, also reported as Nov 1884. Alice Agnes VanNatta married Ernest McLinn on 3 October 1902. Alice Agnes VanNatta died on 21 October 1949 at Dodgeville, Iowa, Wisconsin, at age 62. [S244] U.S. Federal Census 1910 U.S. Federal Census, by Ancestry.com, ED96. Dwelling 53. [S243] U.S. Federal Census 1920 U.S. Federal Census, by Ancestry.com, ED47. Dwelling 126. [S250] U.S. Federal Census 1930 U.S. Federal Census, by Ancestry.com, ED8-1. Dwelling 40. Married Name 29 December 1913 As of 29 December 1913,her married name was Knebel. Etta Thelma VanNatta was born on 31 March 1891 at Harrison, Grant, Wisconsin. Etta Thelma VanNatta married Paul W. Knebel on 29 December 1913 at Grant, Wisconsin. Etta Thelma VanNatta died on 9 July 1964 at Grant, Wisconsin, at age 73. William McKinley VanNatta was born on 22 December 1893 at Harrison, Grant, Wisconsin. William McKinley VanNatta married Ethel L. Doeltz on 2 September 1914 at Grant, Wisconsin. William McKinley VanNatta died on 20 December 1971 at Platteville, Grant, Wisconsin, at age 77 William Vannatta obituary. Clifford Iris VanNatta was born on 10 August 1897 at Harrison, Grant, Wisconsin. Clifford Iris VanNatta died in 1915 at Harrison, Grant, Wisconsin. Name Variation Edith Jennie Crappe was also known as Jennie E.
Name Variation Edith Jennie Crappe was also known as Crapp. Married Name 8 March 1899 As of 8 March 1899,her married name was VanNatta. Edith Jennie Crappe was born circa 1877 at Wisconsin. She was the daughter of Emanuel Crappe and Charlotte (?). [S5] Wisconsin, Wisconsin Marriages, 1835-1900, listed as Thomas S. Vanetta. [S244] U.S. Federal Census 1910 U.S. Federal Census, by Ancestry.com, ED43. Stamp 239. Dwelling 319. [S250] U.S. Federal Census 1930 U.S. Federal Census, by Ancestry.com, ED22-49. Dwelling 123. Name Variation Gladys L. VanNatta was also known as Gladyes. Name Variation Gladys L. VanNatta was also known as Geddes. Married Name 19 April 1922 As of 19 April 1922,her married name was Roesch. 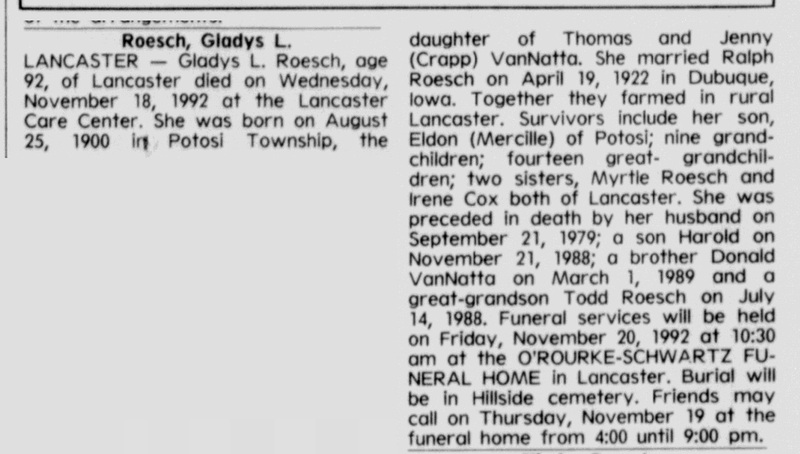 Gladys L. VanNatta was born on 25 August 1900 at Potosi, Grant, Wisconsin. She was the daughter of Thomas Silas VanNatta and Edith Jennie Crappe. Gladys L. VanNatta married Ralph Roesch on 19 April 1922. 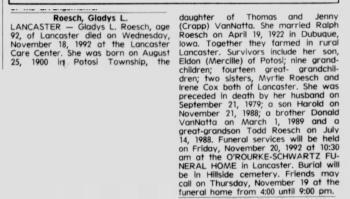 Gladys L. VanNatta died on 18 November 1992 at age 92 Gladys (Vannatta) Roesch obituary. Name Variation Myrtle E. VanNatta was also known as Mertle E.
Name Variation Myrtle E. VanNatta was also known as Mertile. Married Name 14 February 1923 As of 14 February 1923,her married name was Roesch. 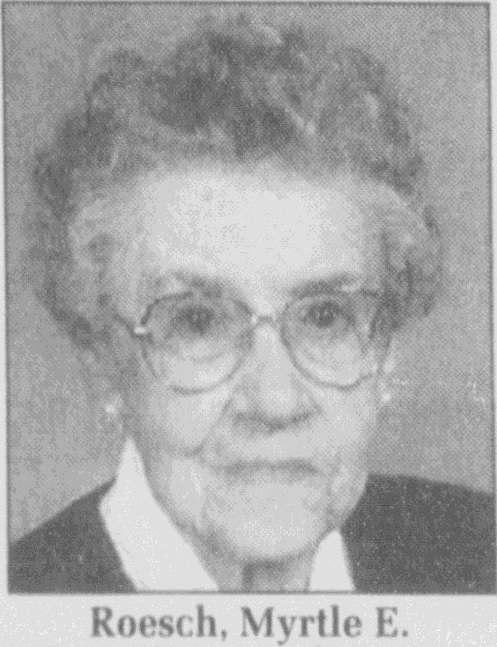 Myrtle E. VanNatta was born on 13 September 1904 at Potosi, Grant, Wisconsin. 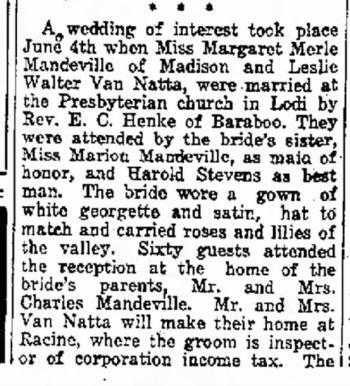 Myrtle E. VanNatta married Floyd A. Roesch on 14 February 1923. Myrtle E. VanNatta died on 9 April 2005 at age 100 Myrtle (Vannatta) Roesch obituary. Married Name Her married name was Cox. Irene E. VanNatta married (?) Cox. Irene E. VanNatta was born circa 1907 at Wisconsin. Irene E. VanNatta died before 2005. 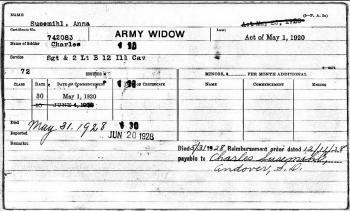 Name Variation Julia Ann Withrow was also known as Grace. Name Variation Julia Ann Withrow was also known as Julie. Married Name circa 1894 As of circa 1894,her married name was VanNatta. Julia Ann Withrow was born in February 1874 at Paris, Grant, Wisconsin, also reported as 1873. Julia Ann Withrow married Samuel Milton VanNatta, son of Moses B. VanNatta and Samantha (? ), circa 1894. Julia Ann Withrow died on 2 May 1956 at at hospital, Lancaster, Grant, Wisconsin, at age 82 Julia (Withrow) Vannatta obituary. Julia Ann Withrow and Samuel Milton VanNatta lived in 1901 at Cornelia, Grant, Wisconsin. Name Variation Leslie Walter VanNatta was also known as Lester. Leslie Walter VanNatta was born on 28 November 1895 at Grant, Wisconsin. He was the son of Samuel Milton VanNatta and Julia Ann Withrow. 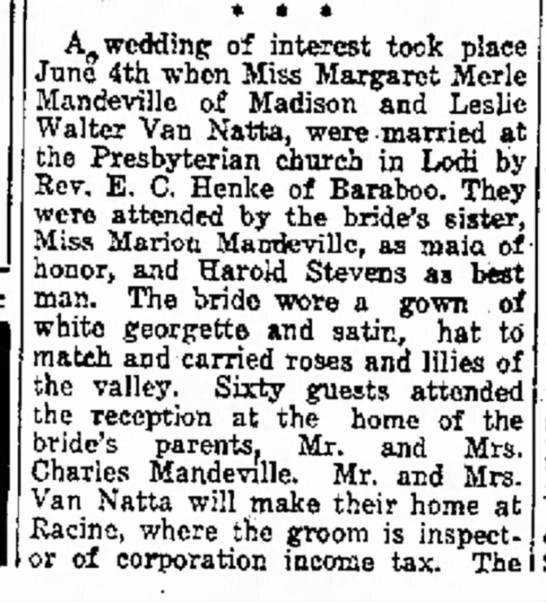 Leslie Walter VanNatta married Margaret Merle Mandeville, daughter of Charles H. Mandeville, on 4 June 1921. Leslie Walter VanNatta died on 29 April 1961 at age 65. Leslie Walter VanNatta graduated in 1913 at Platteville Normal School, Platteville, Grant, Wisconsin. On 5 June 1917 at World War I Draft Registration, Dane, Wisconsin. Married Name Her married name was Matthews. Name Variation Bertha Vannatta was also known as Elbitie N.
Bertha Vannatta married Charles Matthews. Bertha Vannatta was born in February 1897 at Wisconsin. She was the daughter of Samuel Milton VanNatta and Julia Ann Withrow. Married Name 17 November 1901 As of 17 November 1901,her married name was Frahm. Bertha Sophia Balgemann was born on 12 January 1879 at Illinois also reported as 10 Jan 1879. Bertha Sophia Balgemann married Herman Frahm, son of Jacob Frahm Jr. and Margaretha Catharina Dorothea Fedde, on 17 November 1901 at Kankakee, Illinois. She was buried after 29 November 1918 at Saint Pauls Lutheran Cemetery (aka Petersburg Cemetery), near Grant Park, Kankakee, Illinois. [S245] U.S. Federal Census 1900 U.S. Federal Census, by Ancestry.com, ED55. Dwelling 240. Henry Balgemann was born in August 1841 at Hanover, Germany. He married Louise Bultman circa 1868. Henry Balgemann died on 11 February 1919 at age 77. He was buried after 11 February 1919 at Saint Pauls Lutheran Cemetery, Kankakee, Illinois. [S244] U.S. Federal Census 1910 U.S. Federal Census, by Ancestry.com, ED122. Page 17 of 34 on Ancestry.com. [S282] Illinois Kankakee Farmer's Directory, by Illinois, Balgeman, Henry (Louise Bultman) Ch Willie, George; Grant Park R1 Yellowhead Sec7 O173a (1870). Married Name Her married name was Hansen. Married Name 22 July 1866 As of 22 July 1866,her married name was Susemiehl. Anna Christine Frahm was born in September 1844 at Holstein, Prussia, also reported as Sep 1842. She was the daughter of Jacob Frahm and Anna Maria Dorothea Greve. 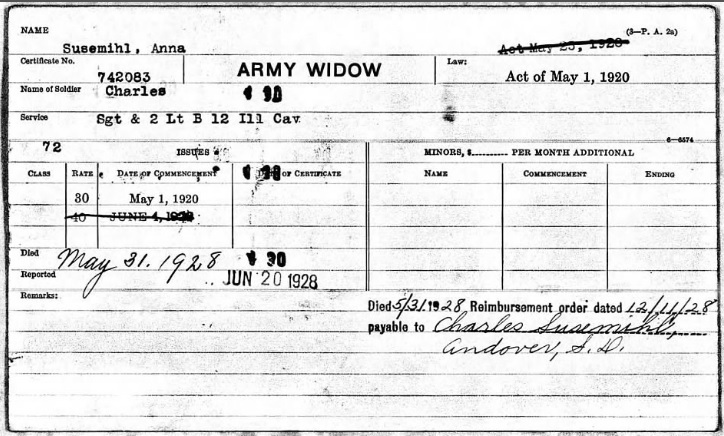 Anna Christine Frahm died on 31 May 1928 at age 83 according to US Veterans Administration Pension Payment Cards (for husband Charles' service in civil war). Ship Name: Rhein. Anna Christine Frahm immigrated in 1858. She had 6 with 3 living in 1900 children. [S186] Illinois, Illinois Statewide Marriage Index, Vol. 00B/ License 00001548. [S248] U.S. Federal Census 1860 U.S. Federal Census, by Ancestry.com, Pg 233. Dwelling 1764. [S247] U.S. Federal Census 1870 U.S. Federal Census, by Ancestry.com, Page 5. Dwelling 34. [S246] U.S. Federal Census 1880 U.S. Federal Census, by Ancestry.com, Page 13. ED15. Dwelling 118. [S245] U.S. Federal Census 1900 U.S. Federal Census, by Ancestry.com, ED55. Dwelling 239. Name Variation Charles W. Susemiehl was also known as Carl Wilhelm. Name Variation Charles W. Susemiehl was also known as Charley. Charles W. Susemiehl was born in November 1827 at Mecklenburg, Germany. 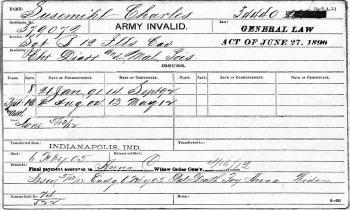 Charles W. Susemiehl died on 6 February 1905 at age 77 civil war pension application by wife Anna Susemihl on 08 Apr 1905. Charles W. Susemiehl immigrated in 1858.